i love front door decor. it all started when we bought our first home, this home. our sweet realtor gave us a wooden "welcome" sign, painted purple and with a big yellow flower. there was already a nail in the entryway bricks just at the right height to hang our new sign, welcoming everyone to our new home. i have loved door signs ever since, and my collection has grown with different signs for different holidays and seasons, and anything that can hang on that nail and make people smile as they approach my front door. last year i invested a big pretty Christmas wreath for our front door. it makes me smile, yall, and i can't wait to get it out of the attic, where it's stored safely in it's own plastic wreath storage container. wreaths have a history, and they weren't born at a craft fair. evergreen wreaths symbolize strength, because evergreens are strong enough plants to endure harsh winters. 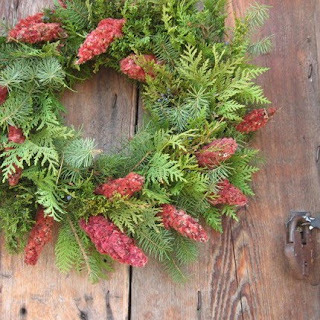 wreaths made with pine or holly symbolize immortality, and cedar symbolizes healing. they are circular and hung on the front door as a symbol for the never-ending love of Christ. how about that? what about you? how do you adorn your front door? your entry way? 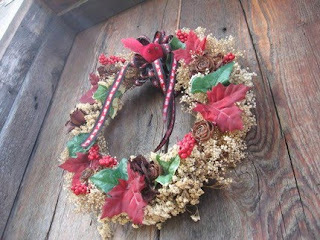 Homemaking Cottage is featuring wreaths at the Christmas Extravaganza this week. check it out and be inspired!